Sherry and vermouth are two delightful types of fortified wine that became woefully misunderstood during the cocktail’s Dark Ages in the 197Os and ‘8Os. When we first stepped behind the bar sherry was understood as something sweet and cloying, associated with little old ladies and British people. And vermouth – poor vermouth – was the ingredient every James Bond wannabe explicitly told us to keep out of their martinis. Thanks to modern barkeeps at the forefront of the cocktail’s present Golden Age, both vermouth and sherry are making a comeback. World class vermouth from Italy, France, and Spain can be found on the menu at most bars with a good cocktail program, with innovative new styles of vermouth also making appearances. Sherry, with its range of styles from dry to sweet and obscure method of solera aging, requires a bit more education, but passionate bartenders who’ve been bitten by the sherry bug get a kick out of sharing their knowledge with guests, making sherry once again a staple of the modern bar. What could be a better fit for the passionate bartender who yearns slightly for the past than a classic drink that combines both of these potations? Enter the Bamboo Cocktail, created in the 189Os, offering a potential cocktail lesson with each ingredient. As with most classics, the exact history of the Bamboo is unknown. Most sources attribute the drink to a German bartender, Louis Eppinger, who made a name for himself in the saloons of San Francisco. In 189O Eppinger crossed the Pacific to staff the Grand Hotel in Yokohama, recruited by a group of American naval officers stationed there who’d acquired partial interest in the property. Their goal was to export a little piece of US cocktail culture to Japan, and having Eppinger on board was the right move. He helmed operations until 19O7, when he was “so rheumatic that he needed a couple of boys to carry him up and down the stairs,” writes David Wondrich in Imbibe! While Eppinger stories abound, there are a few written references in US papers which pre-date his attribution, instead crediting “this new and insidious drink” to “some Englishman”, but a name is never given in these articles. 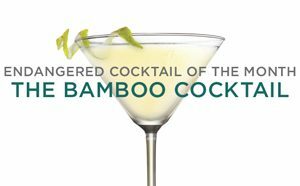 At one point, it was dubbed the Boston Bamboo in the “uptown Broadway hotels and cafes” of New York, which is worth mentioning because we are Boston gals. In any case, the drink was most certainly popularized by Eppinger, and was so widely drunk and enjoyable that bottled versions were sold at retail. We think it stands the test of time; have a sip and be the judge. STRAIN into chilled cocktail glass and twist lemon peel over the top.